Easter is around the corner and for those who observe this holiday, hard-boiled eggs will be a part of this celebration. However, eggs in general are a staple for many whether health conscious or not. Eggs are the perfect food for those of us eating a low-carb or keto diet as they contain a moderate amount of protein (around 6 grams per large egg) and a moderate amount of fat (about 5 grams). Eggs are inexpensive, nutritious, versitile, and quick to prepare. Eating just egg whites is a waste of the most nutritious part of the egg! The yolk contains most of the nutrients and vitamins, which include vitamin D, B12, other B vitamins, vitamins A, E, K, and choline. Eggs are one of the few foods that naturally contain vitamin D.
A large egg has about 211mg of cholesterol. Cholesterol itself doesn’t cause heart disease, but oxidized cholesterol does contribute to atherosclerosis. There are many other dietary and lifestyle factors that contribute to oxidized cholesterol other than eating foods high in cholesterol. Cholesterol is the building block of hormone synthesis and your brain is made up of cholesterol. When you artificially lower cholesterol with statin drugs, you are setting yourself up for memory issues and hormone imbalances. 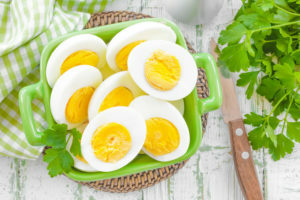 If you’ve recently come across the JAMA study that purports that people who ate two eggs a day had a 27 percent higher risked of developing heart disease and are concerned, please read here why this study is flawed. Are you confused by the following descriptions on egg cartons? Farm Fresh and All Natural mean absolutely nothing! There are no laws or regulations preventing the use of these descriptors by egg manufacturers. Cage free just means that the chickens are not in a cage, but they can be in a big enclosed barn-like building crammed in wing-to-wing with a bunch of other chickens that may be sick and injured. “All Vegetarian Fed” is not something that makes the chickens and their eggs healthier. Chickens are not vegetarians! In the wild they eat worms and other insects as part of their natural diet. The healthiest eggs come from chickens that can roam outdoors (free range or pasture raised), enjoy sunshine, fresh air, and eat bugs in addition to organic food the farmers provide that are part of their natural diet. Organic is important because you do not want chickens eating food that is full of glyphosate (the main active ingredient in cancer-causing RoundUp) and other pesticides or toxins. If the chickens eat toxic food, then those toxins will get passed down to you. The quality of the chicken feed will impact the fat profile of the egg as well. Here is an excellent article on the nutritional benefits and differences of various eggs you will find for sale. How to make perfect hard-boiled eggs in your InstantPot™ (or equivalent) EVERYTIME! Since I now live at altitude (around 4300’), I’ve had to adjust the pressure time in my InstantPot™. At sea level: 4 minutes at high pressure, 4 minutes natural release, then quick release the rest of the pressure and carefully remove eggs with tongs and place in a bowl with ice and water for 4 minutes before peeling. At altitude: 6 minutes at each phase works great. You can put as many eggs as will fit in your InstantPot. Just remember to use the trivet and add at least 1 cup of water to the bottom of the pot. The eggs come out perfect everytime!